Amazon QuickSight is a fast, cloud-powered BI service that makes it easy for everyone in an organization to get business insights from their data through rich, interactive dashboards. With pay-per-session pricing and embedded dashboard, we made BI even more cost-effective and accessible to everyone. However, as the volume of data that customers generate continues to grow every day, it’s becoming more challenging to harness their data for business insights. This is where machine learning comes into play. Amazon is a pioneer in using machine learning to automate and scale various aspects of business analytics in the supply chain, marketing, retail, and finance. ML-powered anomaly detection to help customers uncover hidden insights by continuously analyzing across billions of data points. ML-powered forecasting and what-if analysis to predict key business metrics with point-and-click simplicity. Auto-narratives to help customers tell the story of their dashboard in a plain-language narrative. Today, there’s no shortage of tools to visualize and report on business performance and metrics, but the real insights are often buried deep in aggregates. These insights generally don’t manifest in the existing reports and dashboard but are discovered only several days or weeks later. To add to the problem, growing volumes of data in the cloud make manual analysis such as slice and dice and pivoting too time-consuming and not scalable. As such, customers often resolve to look only at a small subset of their data rather than the whole picture. Amazon QuickSight uses proven Amazon technology to continuously run ML-powered anomaly detection on millions of metrics and billions of data points. This anomaly detection enables you to get deep insights that are often buried in the aggregates, not visible in plain sight, and not scalable with manual analysis. When anomalies are detected, Amazon QuickSight automatically sends you timely email alerts detailing the top contributors to each anomaly. With ML-powered anomaly detection, there’s no need for manual analysis, custom development, or ML domain expertise. For example, say that you operate a business that sells products across various geographical regions. You can now use the ML-powered anomaly detection in Amazon QuickSight to continuously monitor your sales and orders at scale across all products, geographies, and customers. Amazon QuickSight’s ML algorithm continuously learns from your historical data patterns at the most granular level. It can alert you when it detects higher- or lower-than-expected sales for a particular product, in a specific city, or even for an individual customer. With pay-per-session, we introduced industry-first usage-based pricing model for BI. Continuing down that path, we plan for ML-powered anomaly detection to have a usage-based pricing model based on the number of metrics processed in a month. To learn more about planned pricing and examples, see here. Note: Customers will not be charged during preview. Pricing will apply when the feature becomes generally available. We see customers wanting to perform common forecasting tasks that are too cumbersome and often out of reach for most business users. For example, suppose that you are a business manager and you want to forecast sales to see if you are going to meet your goal by the end of the year. Or suppose that you expect a large deal to come through in two weeks that is going to affect your overall forecast. Today, most business forecasting involves tedious, error-prone, and rigid processes using Excel that don’t scale. This is an area where Amazon QuickSight is using ML to simplify. With ML-powered forecasting and what-if analyses in Amazon QuickSight, nontechnical users can now easily forecast their key business metrics with just a few clicks. No ML-expertise or Excel data modeling is required. The built-in ML algorithm in Amazon QuickSight is designed to handle complex real-world scenarios. Amazon QuickSight uses ML to provide more reliable forecasts than traditional means. For example, you can forecast your business revenue with multiple levels of seasonality (for example, sales with both weekly and quarterly trends). Amazon QuickSight automatically excludes anomalies in the data (for example, a spike in sales due to price drop or promotion) from influencing the forecast. Additionally, you don’t have to clean and reprep the data with missing values because Amazon QuickSight automatically handles it under the hood. Finally, with ML-powered forecasting, you can perform interactive what-if analyses to determine the growth trajectory needed to meet business goals. We’ve all been through this before. You open up a dashboard and spend hours staring at the data, sifting and drilling down the charts and deciphering rows and columns in the tables. You try to understand what the data is trying to say and engage in a lengthy discussion with your peers on your interpretations. As companies continue to expand their BI and reporting across all aspects of their business, this problem only gets worse. Auto-narratives is a new feature that we’re announcing that provides key insights in everyday language, embedded contextually in your dashboard, saving hours on manual analysis. 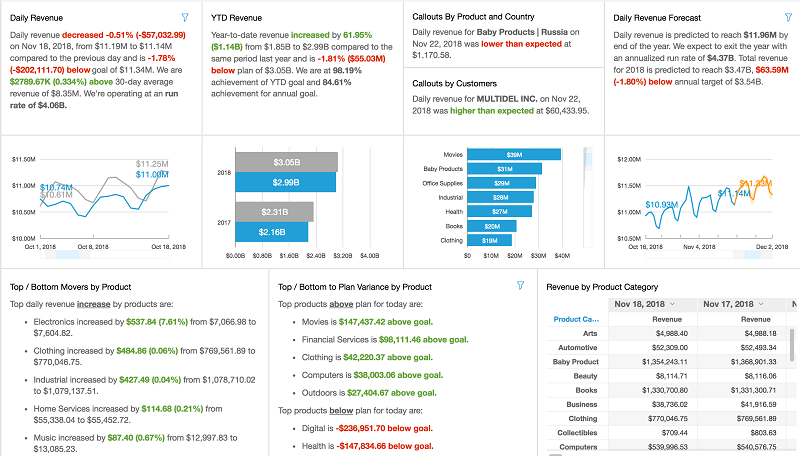 With auto-narratives, Amazon QuickSight automatically interprets the charts and tables in your dashboard and provides a number of Suggested Insights in natural language. Depending on the shape and form of your data, you might get suggestions such as what the day-over-day changes look like, what was the highest sales date, what the growth rate is at and what the forecast looks like for the next seven days. As the author of the dashboard, you have complete flexibility to customize the computations and business language for your unique needs. You can use auto-narratives to effectively tell the story of your data in plain language. Sign up for the preview today! ML Insights are available for preview starting today. You don’t need any ML or domain expertise to use these features. Simply sign up for the preview here.